Pros: A stunning performance from Shireen Farkhoy as she navigates difficult subject matter. Cons: There’s a lot to be angry about here and the arguments don’t always follow a logical flow. A hard-hitting, insightful yet funny look at the difficult issues faced by young British Muslims in a city turned upside down. Tara Theatre is a lovely, warm and really beautiful theatre across from Earlsfield train station in South West London. 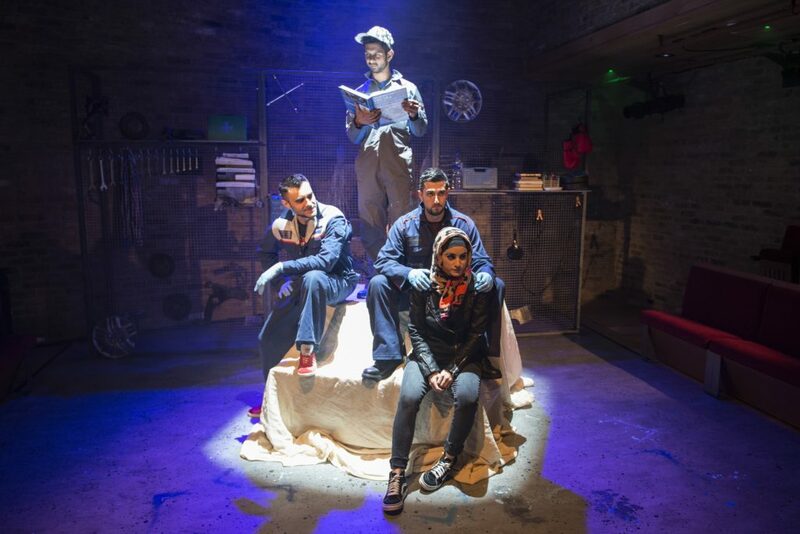 The inside is full of beauty, with intricately carved mouldings covering the woodwork, while the theatre itself is a very raw space which perfectly suits Combustion, a hard-hitting and insightful play about young British Muslims in a city turned upside down. 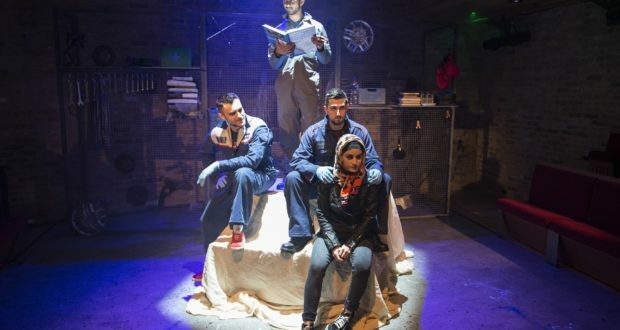 In Combustion we meet hard-working and devout Muslim garage owner, Shaz, his best friends Ali and Faisal and younger sister Samina. It is Ramadan, in a modern-day Bradford which is rocked by the scandal of Asian men grooming young girls. 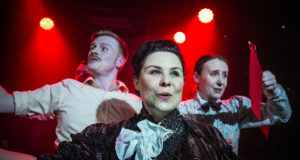 An English Defence League (EDL) protest march is coming up in the city, and the play provides an in-depth look at the issues these characters face as modern-day Muslims in a city rocked by scandal and divided by race. The star of the show is Shireen Farkhoy as Samina. Her character is well-developed, and Farkhoy brings the feisty energy and determination of Samina wonderfully to life. There are some genuinely lovely scenes between Samina and Andy (Nigel Hastings), an EDL supporter, as they spar and battle over their opposing views, whilst trying to find common ground to work with. There’s depth to their dialogues, even if they do get off to a rocky and irritable start. Beruce Khan is enjoyable as Shaz, a man trying desperately to live a quiet and successful life while taking care of his family. He’s at his most interesting when genuinely wanting to protect his younger sister, but inevitably doing it in a way that leaves her isolated and controlled. His character is so much on the side of good and peace and righteousness, but the outside tensions he faces lead to an often troubled relationship with his sister, just proving that external conflicts really do affect everyone involved. There is so much to cover here, and the play serves as a harsh reminder of how deep anti-Islamic sentiment can run in the United Kingdom. But I wonder if the play tries to cover too many issues. Every conversation is a fight, and the multi-character debates soon turn into monologue-esque rants. The anger and frustration is understandable, given that this is a commentary on real-life conflict in society, but the arguments often lack cohesion and flow, and the the characters don’t always take sides that seem logical, clear or sensible for that character’s journey. However, there is a strong overall narrative, and each character does manage to complete an important individual journey whilst contributing to the overall storyline and the development of the group. The staging is exceptional. Metallic tables and chairs provide every prop needed for every location in the play (they make for excellent cars) and a wall of wire mesh at the back adds depth and provides a really tremendous medium to show the characters at a demo. That scene is stunningly beautiful, and brought to life flawlessly. Despite its difficult subject matter, the play is surprisingly funny and does also find a feel-good factor. Faisal (Mitesh Soni), the rather lovable fool, is full of comic relief, but there’s also enjoyment to be found in the surprising friendships and the destination the characters arrive at. It’s certainly not all smooth-sailing; there’s one heck of a twist at the end, which I found both shocking and troubling, but it does lead to a more insightful reappraisal of one character’s role in the play and their conflicting inner emotions leading up to the finale. A thought-process which was very welcome. 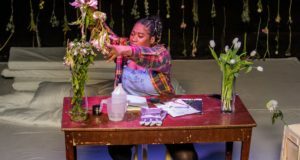 Troubling, insightful and heart-warming; Combustion is an important play, and it’s worth the trip to South West London to see it come to life in a genuinely lovely theatre.